they'll be enjoyed by everyone. This recipe makes 12 cupcakes - choose the decoration you'd like to add from the three options below. 1. Preheat the oven to 180°C, gas mark 4. Line a 12-section tartlet tray with paper cake cases. 1. Roll out the fondant icing to the thickness of a pound coin, using icing sugar to dust the rolling pin and surfaces to prevent it sticking. Cut out your daisy shapes, press a small indent into the centre, then leave to dry for a few hours/overnight. 2. Place the green buttercream in a piping bag with a small star shaped nozzle. Pipe neat blobs of icing in concentric circles around the cupcakes to make the grass 'base' for the daisies. 1. Mix the cocoa powder into the buttercream. Place the buttercream in a piping bag with a large star-shaped nozzle. 2. Pipe a wide ring of buttercream around the edge of each cupcake. 3. Crumble the flakes onto a large plate. 4. Gently roll the piped buttercream 'nest' rings in the flake, being careful not to flatten the piping ridges. 5. 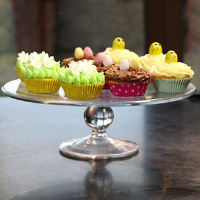 Pipe a blob of buttercream in the centre of each 'nest', then arrange 3 mini eggs on top. 1. Place the plain buttercream in a piping bag with a large star shaped nozzle. Starting form the outside edge, pipe the buttercream in a continuous spiralling circle towards the centre of the cupcake, making sure all of the sponge is covered. 2. Place the yellow buttercream in another piping bag and snip the end to make a small hole for piping. 3. Place the black royal icing in a piping bag and snip the end to make a small hole for piping. Carefully draw two dots towards the top of the first truffle egg - these will be the eyes. 5. Place the egg on the first cupcake, then repeat for the other 12.